Sportsrocket has hired four New York Code and Design Academy alumni into product management and software engineering roles (plus, all four have received promotions after one year on the job)! We sat down with Sportsrocket Product Operations Coordinator Sandra Drakulović to find out why her team loves hiring NYCDA graduates, how their degree-blind interview helps Sportsrocket find the most qualified candidates for the job, and Sandra’s advice for other employers hiring coding bootcamp grads. Plus find out why Sportsrocket plans to hire more New York Code and Design Academy graduates in the future! Tell us about Sportsrocket, and your role there. We are a media company focused on content management. Our product gives viewers access to their favorite sports whenever, wherever, and however they want. We work with some cool clients like AS Roma, the PGA Tour, National Lacrosse League, and Turner Media. We are constantly growing at a rapid rate. Since we are a startup, I wear many hats, though I mostly handle HR for our Product team – this includes nearly every step in the recruitment process. How big is the web development team? We have approximately 40 engineers. How many New York Code and Design Academy graduates have you hired? We have hired four NYCDA grads. In the past year, all applicants who made it to the last round of our hiring process were predominantly from NYCDA. How did you first get connected with New York Code and Design Academy? The first role I recruited for was a Junior Product Manager role. The candidate who got the job was an NYCDA grad and that shed light on the school itself. He mentioned that he knew a few other people interested in developer roles, so we brought some of them in for interviews. 95% of the grads made it through the last round of our interview process, which doesn’t happen very often. What roles specifically have you hired New York Code and Design Academy graduates for? We’ve hired one graduate as a Junior Product Manager, and the others are Software Engineers. Other than New York Code and Design Academy, how do you usually hire software developers? Typically, if they don’t come from NYCDA, it’s a referral from one of our team members. The last resort is posting the roles to online job boards such as LinkedIn or Stack Overflow. Have you worked with any other coding bootcamps yet? What stands out about these NYCDA bootcamp grads? When we interviewed developers from other coding bootcamps, it was brought to our attention they weren’t yet ready to dive into the workforce. They know the content, but in more of a textbook fashion; they don’t know how to apply it. What NYCDA does differently, I think, is teaches students to apply their knowledge to real-life projects. One of our developers, Andrew Schultz, had a fellowship at NYCDA after he finished the program. Shortly after, he joined our team and is now one of our most valuable developers. Did you have to convince your company to hire a bootcamp graduate rather than a CS graduate? When a candidate comes in to do their technical test, the engineering team sometimes doesn’t even know whether the candidate has a degree. If a candidate from NYCDA comes in for an interview and aces their technical test, no one cares to ask what their educational background is like, because they are evidently ready to take on the role. What sort of interview process do developers go through at Sportsrocket? The first line of defense is me emailing the candidate to outline the job role, and if they are still interested, then I set up a call. I speak to them about their experience, if they are employed I ask why they are looking to leave (which isn’t usually applicable to bootcamp grads), and their salary range. If all is a good fit, then I pass them along to our Director of Software Engineering, who will test their skills in a series of tests. If she is happy with the candidates then the next step is a pair programming session. In that session, we bring them into the office and they work with two of our developers for a few hours on whatever the developers are working on that day. It’s a jump-in, hands-on experience. We find that’s effective because not only do the candidates get to see the work they would be doing, but they also get to see if they are able to collaborate with their potential colleagues. If everything’s a fit, an offer is on its way! Have you had to tweak the interview process for coding bootcamp grads? The interview process itself, no. However, the preliminary discussion is of course different – usually I like to ask why they chose the boot camp route or why they chose to change careers, when applicable. I’ll ask how comfortable they are to start applying their bootcamp knowledge to a real product. Sometimes we talk about the app they created as their final project at NYCDA. It’s intriguing to hear about and more often than not, it’s a great way to showcase their talent. You mentioned a technical challenge and a pairing exercise. How did the NYCDA grads do on those? They’ve all done great. If they don’t pass the technical challenge, they don’t make it to the next round. They work in those languages at Sportsrocket. It was actually very hard for me to find Ruby developers in New York, so the fact that NYCDA offers a course on Ruby means they had a pool of qualified candidates for me, which was great. How do you ensure that the new hires are supported to keep learning in their first job? When a new developer starts, we don’t throw them out there on their own – they always have support. Additionally, we like to have in-house courses on occasion, where a group of the engineers can devote two full weeks to learning a new language (or brushing up on a known one) in our office. For one of these developer training sessions, I reached out to Tom Abogabal at NYCDA to see if he could help. He provided us with one of the Academy’s teachers, who came into our office and did an immersive course on Ruby on Rails for two weeks. I could not express my satisfaction enough! Since you started hiring from the bootcamp, have your new hires moved up or been promoted? Yes. Most of our engineers from NYCDA have been moved up to Lead Engineer, and the Junior Product Manager is now a Product Manager! 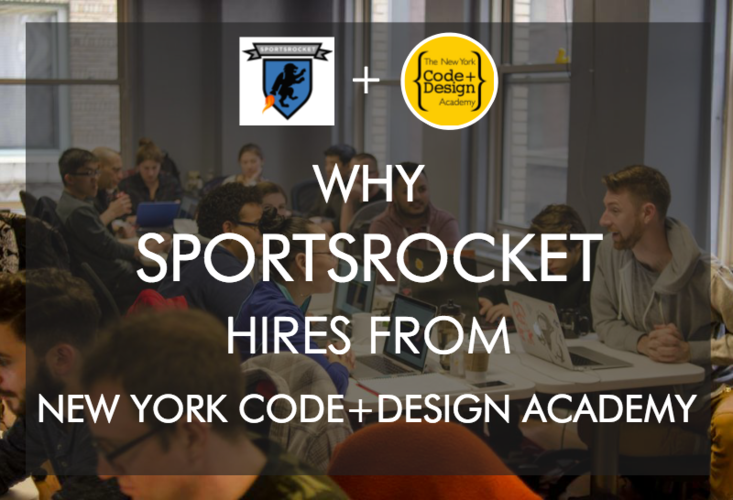 What does the relationship look like between Sportsrocket and New York Code and Design Academy? Do you pay a referral fee when you hire their graduates or are you paying to be a part of their hiring network? We do not pay a fee. With our arrangement, their grads are getting jobs and we’re glad to be getting new, great developers. It’s a win-win! Do you have a feedback loop with the bootcamp at all? Yes, Tom is always open to that. We haven’t had a need to do so yet, but we did discuss their flexible options. If we wanted to do a mass hire at one point, rather than holding a traditional course, they could hold a course tailored to Sportsrocket and our platform, which I think is really cool. So then those cohorts would graduate knowing our entire platform, because that’s what they were trained on. Will you hire from NYCDA in the future? Why or why not? Definitely. At the moment we are expanding both our Bellevue and New York offices. NYCDA has a number of campuses so it will be really great that they’ll be able to offer graduates in other places as we continue to expand. What is your advice to other employers who are thinking about hiring from a coding bootcamp? In general, if you’re hiring from a coding bootcamp, test their knowledge before hiring. Test their ability to do the job itself, not the knowledge they have in a specific programming language. That’s one of the biggest flaws I’ve noticed in the hiring process. Someone can know Ruby – or any language – like the back of their hand, but not know how to properly apply that knowledge. You should be looking to hire applicants who know how to apply the concepts. They’ll be much more capable of getting any job done and immersing themselves in projects. Find out more and read New York Code and Design Academy reviews on Course Report. Check out the New York Code and Design Academy website.